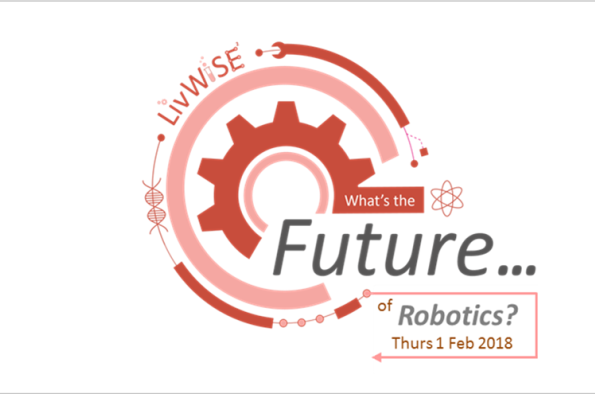 LivWiSE invites you to join us for our next panel discussion on robotics. There is little doubt that artificial intelligence, robotics, autonomous systems and technologies have had a dramatic impact on our lives and the world we now live and work in, but what’s the future for this technological revolution? Will we witness a rise of the robots? Our panel of experts will be discussing this and exploring current applications, possibilities, restrictions and philosophical implications of future technological innovations. Dr Louise Dennis, Post-Doctoral Researcher and Knowledge Exchange Support Officer in the Autonomy and Verification Laboratory at the University of Liverpool. She is attached to the Centre for Autonomous Systems Technology (CAST) at the University of Liverpool, and the Robotic Autonomy Simulation Laboratory (RASL) at the Virtual Engineering Centre, Daresbury. Her background is in artificial intelligence and more specifically in agent and autonomous systems and automated reasoning. She has worked on the development of several automated reasoning and theorem proving tools, most notably the Agent JPF model checker for BDI agent languages; the lambda-clam proof planning system; and the PROSPER Toolkit for integrating an interactive theorem prover (HOL) with automated reasoning tools (such as SAT solvers) and Case/CAD tools. More recently she has investigated rational agent programming languages and architectures for autonomous systems, with a particular emphasis on creating verifiable systems. Dr Rebecca Davnall, Lecturer in the Department of Philosophy (Liverpool). She teachers on the undergraduate module "Philosophy of the Future" which introduces students to the philosophical implications of foreseeable future technological innovations and examines the relevance of metaphysical and ethical considerations to future technological and scientific developments. Dr Samantha Colosimo, Post-Doctoral Research Associate in the Department of Physics at the University of Liverpool and works on a number of projects related to high resolution radiation detection and imaging, including developing semiconductor technology for medical, security and decommissioning applications. Samantha is also a founding member of HiPy, an initiative to teach coding skills and Build an open, welcome community for anyone who wants to learn Python. Ellen Piercy, Devices Manager at Unilever with a passion to develop new technologies that deliver genuine consumer benefits through innovative product features. Joanne Phoenix, Business Development Manager at Sensor City. Sensor City is a Liverpool-based technical innovation centre and University Enterprise Zone. They foster the creation, development, production and promotion of cutting edge sensor technologies for use in a wide range of sectors. For more details or to book your place visit 'What's the future of Robotics?